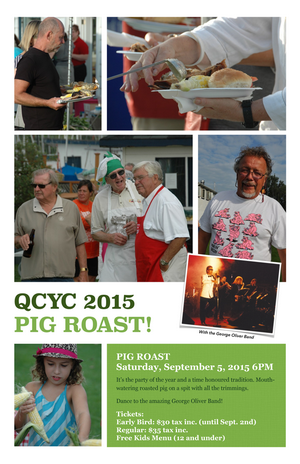 Saturday September 5, 2015 at 6pm. It's the party of the year and a time honoured tradition. Mouth watering roasted pig on a spit with all the trimmings. Dancing to the amazing George Oliver Band! Tickets Early Bird $30 tax included (until September 2nd), Regular $35. Free Kids Menu (12 and under).